I finished my latest quilt project last night. 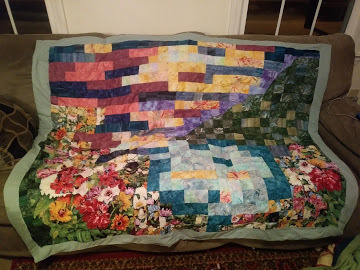 This is a "watercolor" lap quilt made up primarily of 2.5" squares of color with some applique thrown in (in the garden portion). It is supposed to be a sunset, trees, water, and garden as if you were looking out a window onto a scene. Of course, this looked very different in my mind when I started it, but I'm pleased with how it came out. Now the challenge is to come up with a new idea. On the plus side, these projects take me 1 - 2 years (I only work on them a couple hours a week) so once I have one, it keeps me busy for quite a while.